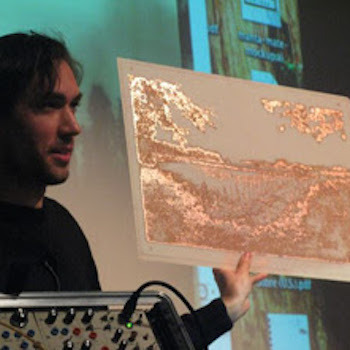 Jeff Snyder is a composer, instrument designer, electronics performer and sound artist working in the New York City area. His works have been performed by a variety of ensembles, including the Timetable Percussion Trio and the Wet Ink Ensemble. He performs and records in an analog synthesizer duo with Sam Pluta, called exclusiveOr. He also plays modular analog synthesizer in an improvisational trio with bassonist Katie Young and violinist Erica Dicker, and performs on a hacked 1980s pen plotter with Victor Adan in the Draftmasters. In 2009, Jeff Snyder founded Snyderphonics, LLC, a company devoted to the invention of new and unusual musical instruments and controllers. Jeff received his doctorate in Music Composition from Columbia University in 2010, studying under Brad Garton and robotics artist and Dorkbot founder Douglas Repetto. He is currently the Technical Director of the Princeton University Electronic Music Studios, and the Associate Director of PLOrk, the Princeton Laptop Orchestra.